Last year’s war with Israel came as a surprise except for those who initiated it. If you believe the analysis even they did not expect the scale of the confrontation. Most Lebanese I know found themselves in one of two camps. For certain sections of the population the question was never asked. For many others who publicly supported Hezbollah the issue was less straightforward. In their private conversations, they were unable to hide the frustration and anger at been caught in a situation they had not chosen for themselves and their families. These differences of opinions became clearer when attempts to organise an effective movement among Lebanese expatriates stumbled into a wall of hostility and intolerance on both sides. The result was a weak and divided community, unable to deliver an effective message of protest. This no doubt affected public support for the Lebanese cause in Western capitals. The situation would be even more worrying if Lebanon found itself in the midst of further armed conflict. Not a day passes without Israeli officials warning that Hezbollah had rearmed and was more a threat than ever before. 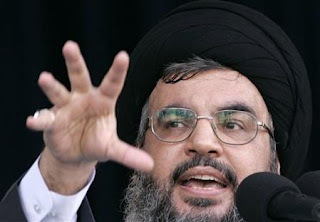 Sheikh Hassan Nasrallah in his fiery speeches confirmed these reports. The possibility of a further round is real and could be very near. On the ground public opinion has shifted. These same people who were reluctant supporters of Hezbollah at the time the IDF was shelling Lebanese towns and cities in a savage and disproportionate way might find it more difficult to keep their criticism veiled on this occasion. Hezbollah has done nothing to reassure these Lebanese and as far as he is concerned is not interested in their views. When asked about his thoughts on becoming a mythical Lebanese or Arab leader Nasrallah said this was unimportant and that he was only interested in God’s blessing. While this is consistent with his beliefs, in a tensely divided country the blessing of the majority might not be something to dismiss lightly. Since last summer the animosity between the two main factions has reached unprecedented levels, we have witnessed more political assassinations and blood has been spilled on more than one occasion in inter-sectarian confrontations. One wonders if the well-known Israeli strategy to shell the Lebanese into auto-destruction might succeed where it failed last summer. Hezbollah might be relying on the traditional Arab attitude: ‘it is me and my brother against my cousin but me, my brother and my cousin against strangers’. In the past twelve months Lebanese family ties have certainly been tested to limit.